When the Supreme Court ruled last spring that states could legalize sports gambling, Atlantic City’s Golden Nugget hotel and casino mobilized to add The Sportsbook off its Main Atrium. 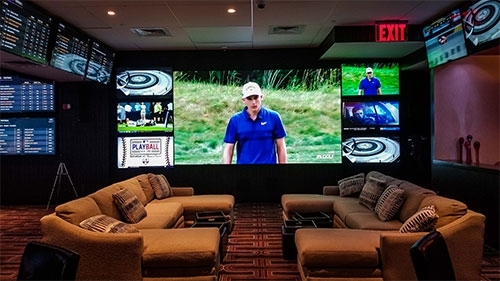 The new venue, which encourages guests to “wager, watch and win,” features four Absen LED walls driven by four Analog Way NeXtage 08 - 4K AV processors. 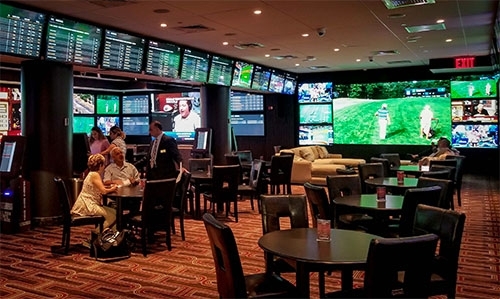 The Sportsbook features seating for more than 100 and offers a large array of big-screen displays and monitors presenting live sporting events and details on statistics and wagers. The venue opened just in time for the start of the college football season. Tom Knauss, CTS-D President of KMK Technologies in Chappaqua, New York and Monroeville, New Jersey, guided the hotel operations and facility staff who were responsible for all the new construction. Then KMK provided the AV technical support for The Sportsbook’s complex audiovisual environment. Each NeXtage processor is dedicated to an Absen LED wall, which displays 16x9 1080p or 1080i HD content sourced from cable and satellite television feeds. The big screens give an up-close-and-personal look at sporting events for guests relaxing on comfy leather couches or enjoying drinks and food at tables scattered throughout the space. “NeXtage was easy to integrate and program – an important factor given the short time allotted to the project,” Knauss says. “It was great to have Seth on site to activate the processors for us.” KMK oversaw the electrical rough-in and equipment installation labor which was provided by the Golden Nugget Entertainment and Facilities Staff. The AV equipment for the project was supplied by Total Video Products, Inc. of Mickleton, New Jersey.